Founded in 2015 by German pianist and composer Nils Frahm, Piano Day was conceived "to celebrate the piano and everything around it: performers, composers, piano builders, tuners, movers and most important, the listener." It is celebrated on the 88th day of the year, equal to the number of keys on a piano. As an instrument that has brought us some of the most celebrated works of all time, this is a festival we are 100% on board with and we are proud to announce the release of eight new piano works for the occasion. Composer of no less than five of the aforementioned pieces is the hugely talented American composer Peter Broderick. We were lucky enough to catch up with him to ask a few questions about Piano Day, as well as his music and inspirations. Sheet Music Direct: On 29 March, we will be celebrating the fourth annual Piano Day. What is the importance of this day to you? 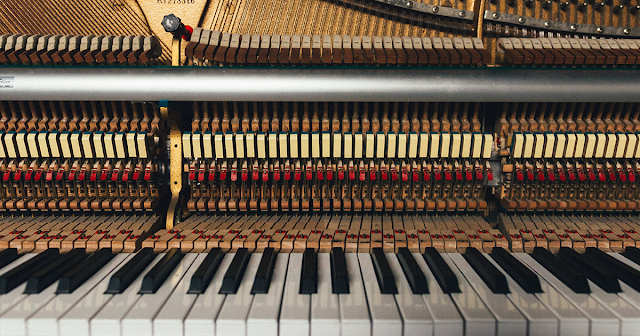 Peter Broderick: Well, the piano has always been one of my favorite instruments. When playing music alone, the piano can feel so much more rewarding than some other instruments I play, like the violin for instance. With the violin, you generally play one note at a time, and the range of frequency is not so big. But with the piano, you have this huge range of sound from the deep bassy low notes to the shrill high ones. It’s such a rich a full sound for just one person on one acoustic instrument. I also think that the piano sounds beautiful when played in a very simple way, and in that sense, anyone can play it. It seems the Piano Day thing has really caught on, and many people around the world feel it’s nice to have a special day to celebrate this wonderful instrument. SMD: Can you tell us your inspiration behind the pieces you are releasing exclusively for Piano Day? PB: There’s one called "Ceasefire." This piece was actually intended to sound like something you might hear someone play at their first piano lesson. It’s very simple and yet for me, it carries a significant emotional weight. There’s one called "A Snowflake," which is the opening track from my first proper solo album Float. This piece still brings compliments to me after all these years; it’s a nice feeling when something holds up over time. "Carried" is from my most recent piano-based album Partners and for me, this one has a more mysterious feeling to it as compared with some of my other piano works, which I would describe as more sentimental. For me, this one is about that great big wonderful mystery of life—so tangible sometimes and so ethereal at other times. "Low Light" is a simple minor key piece, which I recorded in the wonderful Grunewald Church in Berlin. And finally, "Bernard & Elba’s Waltz" is a really special piece to me. Again, this one has held up over time, as I wrote it in my late teenage years and I still love to play it. It’s a simple, rather romantic sounding waltz. I remember when I wrote it, I really wanted to impress a girl from my school. One night, she came over and sat right next to me on the piano bench while I played it, my hands completely shaking the whole time. And when I finished she said, “That’s the most beautiful song I’ve ever heard.” Can you imagine how pleased teenage Peter was!? Broderick performs "Carried" live in London for Piano Day 2016. SMD: Your works have been featured across a wide range of mediums—tell us about one of your favourite projects to-date. PB: There’s a French multi-media artist I’ve followed for many years named Félicia Atkinson. She’s made some wonderful poetry books, is an incredible visual artist with a very playful style, and she also makes music. Her work has been a huge inspiration for me over the years. In 2014 I got the chance to spend a couple days with her in the studio and make some music together, and we released a duo album under the name La Nuit. I feel like this project went completely under the radar, but it’s most certainly one of my favorite things I’ve been involved in to-date. SMD: What are you working on currently that we can look forward to? PB: Lots of solo touring this year! And touring with my wife, Brigid Mae Power, as well—with her, I get to play the drums! I’m currently putting the finishing touches on a film score that will likely be released one day, and I also just recently contributed vocals for a really dancey electronic track by someone else, which has been a really different and fun experience. SMD: What advice would you give to aspiring professional pianists? PB: Follow your heart. Have fun with the piano. Let it be your friend. Peter Broderick is currently on tour in Europe. Check out the schedule at peterbroderick.net for a stop near you! If you're in the area, he will actually be performing a show for Piano Day in Ljubljana, Slovenia. Get more details here. From the newest releases to award-winning bestsellers and everything in between, Sheet Music Direct provides accurate, affordable arrangements of all your favourite songs available to download and play instantly. Powered by Hal Leonard and Music Sales.